Carl's in Italy this week; last week he was in Belgium. One of the things I always have trouble remembering to do while he's gone is feeding the fish. So I thought I'd post 13 different kinds of fish we've had in hopes that it would help me remember. So far, so good--I remembered this morning, at least! Neons. The cute, colorful, itty-bitty schooling fish everybody starts off with. Zebra fish. They just look like fish to me, but Carl thought they were different. They sure were--they tended to be suicidal. A couple of times I'd come downstairs in the morning and find a dried-out zebra fish on the floor next to the aquarium. Ick. Discus. It wasn't long before Carl decided to branch out into more exotic fish. The discus were interesting-looking, but were very difficult to keep. They didn't last long. Plecostomus. Ugly critters, but essential for keeping the tank clean. Knife fish. Now this one was interesting. Piranha. Carl was very fond of the piranhas. For quite a long time, we had a plecostomus, a knife fish, a handful of mollies (which I didn't show because they're boring), and 4 piranha. Amazingly enough, the tank was balanced, and they all lived together just fine. Then Carl saw another knife fish in the pet store. Within two weeks, all we had left were the piranhas and the plecostomus. Yellow tang. Eventually, the freshwater fish were no longer a challenge, so Carl moved on to saltwater. Started out with the standards, like this. Clown fish. And this. We had one that must have seen the movie--it kept escaping into the filter. Bat fish. These were absolutely gorgeous, but very fragile. They didn't last long. 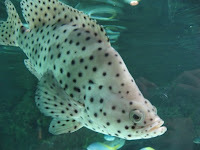 Leopard grouper. For the longest time, we had a hex tank with just the big lion fish and this one. It got huge. And ate even more goldfish than the lion fish did. Picasso trigger fish. 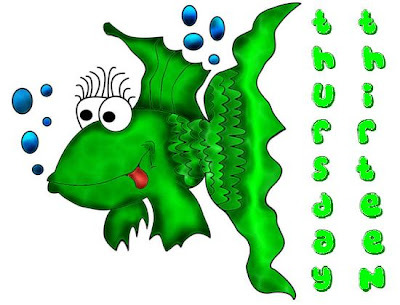 Eventually, the vicious fish idea got old, and Carl turned to just unusual ones. This was his holy grail for quite a while. Cow fish, a form of box fish. We had several of different sorts. Very alien-looking fish. Most of the big changes had to do with moving, and we'd give away the fish when we moved. For example, we never had saltwater fish here in Germany. So when we moved from Ann Arbor to Heidelberg, we put the lion fish and the grouper in coolers with bubblers and took them to my mom's. She had them for 3 or 4 years after that. We've had quite a lot more kinds of fish than this--I was surprised once I got started how many I remembered--but these were the first ones I thought of off the top of my head and/or could find decent pictures of. Interesting TT. WHy didn't the piranha eat the Plecostomus? Great list. They are all beautiful but by I like the Clown fish the best because it reminds me of the movie "Finding Nemo":) Happy TT and thanks for stopping by. I couldnt imagine it being cold year round. That must have been a hard adjustment. Mexican food in Cali is the best. I could eat it every day! I never had any salt water fish, but the first half of your list made me get all misty for my childhood. I never saw a Bat fish-very interesting and the Picasso Trigger Fish is beautiful. What a change of pace. I love fish. We used to have African Cichlids. They were some of the most amazing creatures to watch in their habitat. They had a lot of character. We had a fish tank when the kids were little. A couple of fish went suicidal and ended up outside the tank. Weird. I love all of your photos. Brings back memories. I've had neons, zebras, a beta and a bunch of guppies. Right now, though, I just have Caligula the cat. I LOVE aquariums. I'd love to have a real one at home but I'm afraid of all the maintenance. I can barely manage to keep one stupid zebra fish alive, and his bowl is disgusting. Someday. I've never had salt-water fish, I hear that the tank is harder to keep up. 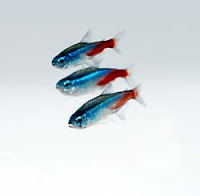 I love Neon Tetras though, they are cutsy! We used to have a blue beta fish that we loved a lot. But no big tanks of fish. That Picasso one is striking, alright. We've had a 55-gallon for years. It's always been freshwater, but don't think I'm not tempted to try saltwater fish! I loooove lion fish. I have no idea why; they just speak to me for some reason. Wow! These are amazing! I've never heard of some of them. 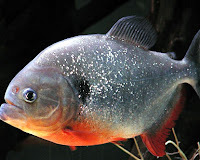 That's interesting about the piranha and the knife fish. Sounds like a turf fight and the piranha won. I can honestly say I've never seen a bat fish before. Weird. My sister had fish through college: a beautiful beta, a few tetras, a black and white pair of mollies after the tetras died that she called Ted and Whoopie (doesn't that date her tank! ), and a pleco. Very cool. I love to look at fish. I wanted to get some but I'm afraid I'd forget to feed them, too. LOL! Gosh that's neat. I wondered if you kept salt water fish in Germany - that would be really hard! I use Google calendar to remind me of things, btw, it texts my phone! WOW what a interesting fishes! 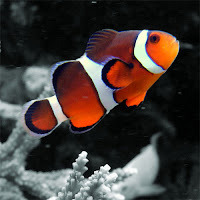 I think the clown fish remind me of the litle fellow in "Find Nemo" :) The Lion Fish are gorgeous! I never seen one like it. How big is your fish aquariums tank? I know of uncle who had a big aquariums filled with BIG fishes inside. I like fish, but I have never had much luck with them as pets:( Great list! Some beautiful fish! I love the bright coloured ones the best, like the clownfish and the yellow one. Thanks for visiting my grandmothers TT.